There is strong empirical evidence of a secular rise in intelligence, but a lack of consistently measured data has hampered the identification of a similar increase in non-cognitive skills. Based on an analysis of half a million Finnish males, this column presents evidence that a long-term increase in scores for traits such as self-confidence, sociability, and leadership motivation has taken place. Just as with cognitive abilities, higher test scores for personality traits predict higher earnings. The secular rise in intelligence across birth cohorts is one of the most widely documented facts in psychology. It is interesting for economists because intelligence is a key predictor of economic outcomes such as education, occupation, and income. Although non-cognitive skills are also known to be important, there is a lack of consistently measured data on the non-cognitive skills of successive cohorts, and so there is little evidence on the equivalent long-term trends. Our recent research sets out to document these trends in personality traits of young adult males (Jokela et al. 2017). To do this, we use test data from 419,523 males in the Finnish Defence Forces. This covers 79% of the population of male Finnish citizens born between 1962 and 1976. The tests administered include one for personality which measures eight traits, using between 18 and 32 yes/no questions for each trait, and a cognitive test which contains three multiple-choice subtests with 40 questions each. Both of these tests are taken in the second week of military service, typically at age 19 or 20. Items in both tests have remained unchanged, but changes in the administration of the personality test mean that the results for the last three birth cohorts (1977-79) may not be comparable. Figure 1 shows the evolution of average scores in our data, depicted in standard deviations from the earliest birth cohort. The increases are largest for self-confidence, sociability, and leadership motivation, with averages for the 1976 cohort about 0.6 standard deviations above the average of the 1962 cohort. The only trait without a clear trend is masculinity. Average scores for all three cognitive subtests show secular increases of similar magnitude as the personality traits. These magnitudes are in line with previous evidence for trends in IQ scores across many countries, where average scores have increased at a rate of 0.2 standard deviations per decade since the 1950s (Pietschning and Voracek 2015). Note: The break in personality test scores reflects a change in test administration. We convert the test scores to interval scale by anchoring them to average annual earnings at age 30-34, so that we can obtain a quantitative interpretation for the trends. We regress earnings on all personality test scores and use the resulting estimates to predict earnings for each combination of test scores. This predicted earnings measure is our anchored personality test score. Cognitive test scores are anchored similarly. 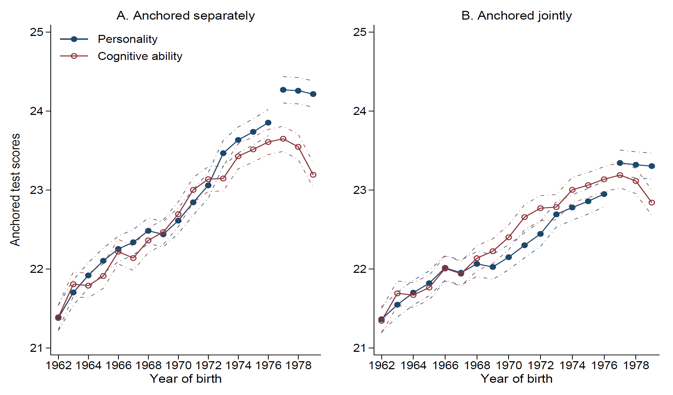 Figure 2 shows the means of the anchored test scores across birth cohorts. The trends are very similar for personality and cognitive ability. When anchored separately, they show an increase of about €2,500 between the 1962 and 1976 cohorts for personality and €2,200 for cognitive ability. In other words, based on a time-invariant model for the relation of test scores and earnings, the increase in personality test scores predicts about 12% higher earnings for the 1976 cohort than for the 1962 cohort. Based on cognitive test scores, the predicted increase is 10%. An anchoring regression in which both sets of test scores are included at the same time reduces the magnitude of both trends to 7% for personality, and 8% for cognitive scores. We also have register data for the one-fifth of males who did not take the military tests, usually because they chose to do civilian service or were exempted on health grounds. This allows us to show that the trends were not due to changes in selection out of military service based on observable characteristics. Trends in personality coincide with trends in background characteristics that are correlated with personality. There have been decreases in family size and increases in parental income, parental education, and urbanisation. All of these background variables have been evolving in the direction that predicts higher levels of personality traits, that are in turn known to predict higher incomes (Groves 2005). It is therefore natural to ask to which extent our observed cohort trends in personality could just be reflecting changes in the composition of the population by background characteristics. To answer this question, we apply the reweighting procedure proposed by DiNardo et al. (1996). In effect, we ask what would be the distribution of test scores if the relationship between background variables and test scores had stayed the same as it was in 1962, but the distribution of background variables was the same as observed in 1976. We find that 33% of the increase in the anchored personality test score could be attributed to changes in background characteristics. Beneficial trends in background characteristics are more important for explaining changes in cognitive ability than in personality, with 64% of the increase in anchored cognitive test scores attributable to the change in composition. These composition effects are mostly due to improvements in the education of parents. Later cohorts may also have been more motivated or more adept at test-taking, even without any changes in underlying traits. We are unable to measure changes in motivation or in the ability to game the test, nor are we able to link test scores to trait-typical behaviour (for example, whether individuals with high sociability scores were highly sociable in real life). We are able, however, to assess the predictive validity of test scores for later life earnings, and the test scores are better predictors of earnings for later cohorts. We cannot tell whether the traits as measured by the personality test are indicative of gaming ability, or something closer to the labels of the traits, but they are economically valuable and increasing across birth cohorts. DiNardo, J, N Fortin, and T Lemieux (1996), “Labor Market Institutions and the Distribution of Wages, 1973-1992: A Semiparametric Approach”, Econometrica 64: 1001-1044. Groves, M (2005), “Personality and the intergenerational transmission of economic status,” in S. Bowles, H. Gintis and M. Osborne Groves (eds), Unequal chances: Family background and economic success, 208-231. Princeton: Princeton Univ. Press. Jokela, M, T Pekkarinen, M Sarvimäki, M Terviö, and R Uusitalo (2017), “Secular Rise in Economically Valuable Personality Traits”, Proceedings of the National Academy of Sciences 114 (25): 6527-6532. Pietschning, J and M Voracek (2015), “One century of global IQ gains: A formal meta-analysis of the Flynn effect (1909-2013)”, Perspectives on Psychological Science 10: 282-306.